The Awami League mayoral candidates were unofficially declared elected in Rajshahi and Barishal city polls on Monday while the announcement of the results was postponed in Sylhet. In Rajshahi, Awami League mayoral contestant AHM Khairuzzaman Liton bagged 165,096 votes to defeat his nearest rival Mosaddek Hossain Bulbul of BNP who polled 77,700 in all the 138 election centres. Returning officer Syed Amirul Islam announced the results around 11:45pm. In Barishal, AL candidate Serniabat Sadiq Abdullah came out victorious getting 107,363 votes while Mujibur Rahman Sarwar of BNP received 13,135 in 107 centres out of total 123. Returning officer Mujibur Rahman announced the results around 11:50pm. In Sylhet, the announcement of the results was postponed as the number of votes in two centres where voting was suspended is higher than the difference between the two leading candidates’ tallies. BNP mayoral candidate Ariful Haque Chowdhury bagged 90,496 votes in 132 centres out of total 134 while AL’s Badar Uddin Ahmed Kamran got 86,870 votes. Ariful was leading by 4,628 votes while the number of voters in the two centres is 4,787. Under such circumstances, returning officer Mohammad Alimuzzaman postponed the announcement of the results around 11:45pm. Earlier, voting in the elections to Rajshahi, Barishal and Sylhet city corporations was held amid election boycott, allegations of rigging, ouster of polling agents and other irregularities. The balloting that started at 8:00am continued till 4:00 pm. Bringing various allegations of irregularities, including driving out of its polling agents and stuffing ballot boxes, BNP said the ‘naked vote rigging by the ruling party got exposed in Barishal, Sylhet and Rajshahi city corporations. “We’ve been talking about the government’s blueprint over the elections in the three cities since the beginning of the electioneering, and it got exposed nakedly today,” said BNP senior joint secretary general Ruhul Kabir Rizvi at a press conference at the party’s Nayapaltan central office. In Barishal, BNP mayoral candidate Mujibur Rahman Sarwar, Communist Party of Bangladesh (CPB) contestant Abul Kalam Azad and Islami Andolon Bangladesh candidate Obaidur Rahman Mahbub boycotted the polls, alleging widespread vote rigging and other irregularities. AL candidate Serniabat Sadiq Abdullah cast his vote at Government Barisal College Centre at 8am, while BNP candidate Mujibur Rahman Sarwar at Sayeda Mojidunnesa High School at 8:15am. Sarwar, however, boycotted the polls bringing the allegation of vote rigging. He announced the decision at a press conference at Barishal Press Club at noon. Besides, Islami Andolon Bangladesh candidate Obaidur Rahman Mahbub and Communist Party of Bangladesh (CPB) contestant Abul Kalam Azad pulled out of the election race citing the same allegations. 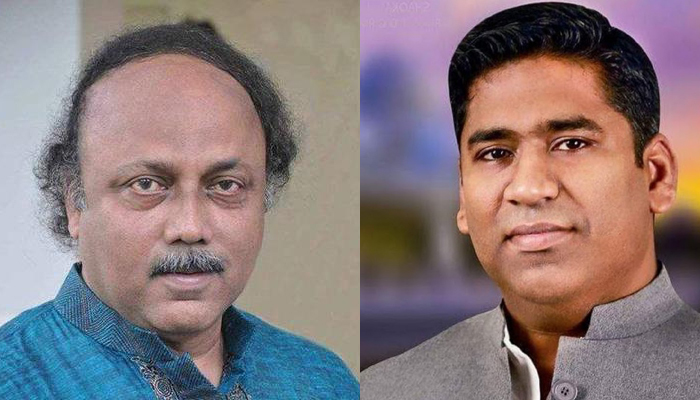 Bangladesh Samajtantrik Dal candidate Manisha Chakrabarty and Jatiya Party candidate Md Iqbal Hossain turned down the elections. Manisha said her polling agents were driven out of the voting centres while votes rigged at many centres. They demanded the Election Commission to postpone the polls due to vote ‘rigging’ by ruling party men. Sarwar claimed that his polling agents were obstructed from entering at least 70-80 centres. In Rajshahi, Awami League’s AHM Khairuzzaman Liton cast his vote at Satellite Town High School around 8:30am. BNP mayoral candidate Mosaddek Hossain Bulbul refrained from casting his vote protesting irregularities in the city corporation election. The BNP mayoral candidate took position in front of Islamia College polling centre in the city’s Binodpur area protesting the ouster of the party’s polling agents from different polling stations. Bulbul also alleged that BNP supporters were obstructed from casting their votes. He also demanded the presiding officer make public how many ballot papers were there at the centre and threatened not to leave the place until he gets the account of the ballots. In Sylhet, BNP candidate Ariful Haque Chowdhury cast his vote at Roynagar Government School at 8:30am and AL’s Badar Uddin Kamran at Government Pilot School Centre under 18 No ward at 08:45am. Councillor candidate and Jubo League leader Rimad Ahmed Rubel along with his supporters allegedly captured the polling centre at Khasdabir Government Primary School at 50 No ward around 9:45am and stuffed ballot boxes locking the door. Then voting in the polling centre had been suspended for an hour. Besides, voting was suspended at Shahjalal Jamia Islamia Kamil Madrasah polling centre at Pathantula for 15 minutes following a clash between the activists of Awami League and Jamaat-e-Islami, said presiding officer Jamil Ahmed. Meanwhile, police fired shots in the air at Kazi Jalal Uddin High School centre in 18 No ward around 11am as the supporters of two councillor candidates captured the centre. The voting came to a halt following the incident. A vehicle was also vandalised. BNP mayoral candidate Ariful Haque Chowdhury alleged that his agents were kicked out from two polling centres. He came up with the allegation after visiting Chandu Shah Centre around 9:45 am. The two polling centres are Chandu Shah Dakhil Madrasah and MC College Shishu Biddalya under 21 No ward, he said. The city elections are the last major polls before the next general election expected to be held in December this year.